Doomsayers cite atrocities as signs the end is near, but atrocities around the globe have occurred since we stood up on two legs and wielded a club. Three films I watched of late concerned the plight of children around the world today. Their atrocious living conditions affected me, and I struggled to cling to anything positive. Films like Osama, Innocent Voices, and Slumdog Millionaire illustrate a great irony. Children are the unexpected heroes of humanity. Fragile and innocent, adults are supposed to protect them. Their pain and loss of innocence seems more tragic than an adult simply because they lack the experience to deal with hardship. Therefore, children forge on. Scarred? Yes. Crippled? Yes. Many adults in their situation would cave in to despair and suicide because their experience tells them it is hopeless to continue. To children alone and in deplorable situations, there is no option but to carry on; their resistance to death creates a strength that’s inspirational, and that’s how I resisted feeling like Leeloo and avoided becoming a cynical recluse waiting for the end of the world to happen or waiting for Korben/Bruce to convince me the human capacity for love trumps blind destruction. It does. Despite the decay and pointless killing, love in all its guises makes the unbearable, bearable. There plods along history: decade after era, after millennia, repeating itself. The political fundamentalist movement of the Taliban ruled from 1996 until December 2001 when the U.S. led invasion of Afghanistan overthrew the Taliban. It has since regrouped as an insurgent. The film Osama was filmed in Kabul, and the Taliban are in charge, removing all the rights from women. They are not allowed to speak in public. Their skin must be covered. They cannot work. They cannot go to school or receive adequate medical care. No female is allowed to walk outside home walls without a male guardian. Males barter and buy women at their discretion forming concubines with locks on their doors keeping them in. It is inconceivable as a Western woman to understand the imprisonment, the chattel status, the utter dependency of a female under the Taliban rule. The plot revolves around a family of three females whose husbands and sons are dead. They are left to starve since they are not allowed to work. Desperate, the mother and grandmother shave the girl’s hair and disguise her as a boy and the pre-teen girl transforms into Osama. Her troubles only just begin. As a boy, she is recruited to serve the Taliban and is sent to an encampment of boys to learn how to be a soldier. It is a rare film showcasing the lives behind closed doors as well as the tribulations facing boy soldiers. Marina Golbhari plays the overwhelmed Osama beautifully. The cinematography is strong with reoccurring motifs suggesting the loss of innocence such as the upward angle from the depths of a well. Osama was punished and tied and dropped into a stone well. From the depths below, the camera looks up and the drips of her tears fall into the water. It is only after she is released that the viewer understands the liquid was blood–she began menstruating and her cover is blown. 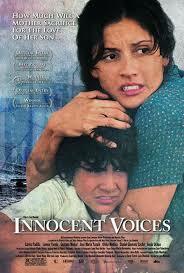 Based upon the true story of Óscar Torres’s childhood, Innocent Voices is a Mexican film directed by Luis Mandokil about the Salvadoran Civil War in the 1980s. The film brought awareness of the injustice of innocent lives and the military use of children. In El Salvador, when a boy turned 12, they were taken and forced to serve in the military against the guerillas. The film’s protagonist is Chiva, head of the house at age 11, with charm and smarts to outwit the military who come to find him. If you like coming-of-age stories, you would like this film of a boy who became a man at age twelve. One of my favorite films, certainly from the decade, is this Danny Boyle all- around Oscar winner. The most upbeat of the three choices, the musical score is what elevates this film. It allows the audience the emotional break to care for the kids and take in the abuses and deplorable living conditions of the Mumbai’s orphans who roam the streets like dogs scavenging an existence. They are clever and funny. Another strength of the film is Boyle’s use of cinematography. With three stages of growth, the three musketeers, Salim, Jamal, and Latika, are children, teenagers, and adults. The duality of plots–how Jamal comes to know the answers to the questions on the game show, “Who wants to be a Millionaire?” and the plot of the love triangle was not easy to weave on the screen. Boyle’s use of transition was exemplary. For instance, to suggest the passage of time and the growth of boy to teenager, the brothers were pushed off the train and rolled down the hill, through the dirt, and the dust cloud mutes their transformation. They sit up and are teenagers. It’s such a well-crafted film, I never tire of watching it. Latika wears the color yellow throughout the film, and this motif makes me appreciate the film as does the redemption of Salim, the hard, older brother, and use of senses and colors throughout. It’s a beautiful film despite the depressing plight of India’s slumdogs. Here, the theme of resiliance is exemplified and their courage inspirational. Jai Ho! How close have you been to a Movie Star? Thank you for recommending these movies. Even though I’ve seen slumdog millionaire and very much enjoyed it, I certainly do not go out of my way to research similar movies. I’m looking forward to your future film reviews. Hi, there, Sophia! Thanks for your comments; it means a lot to me. I love Danny Boyle films and this is my favorite of his. Slumdog is too cool. The other two are more bleak and realistic but done well and worthy of a viewing. Slumdog could be considered a somewhat depressing movie. My wife ‘”loved it” but at the same time said she does not want to watch it again. I am thinking that may have been many peoples reaction. I have lived in countries similar to India and these can be the realities for so many kids. But I have to say no matter what the hardships so often these children seem happier than ours. They know nothing else so do not see hardship, only adults see it. Their lack of a bedroom full of electronics makes them actually play outside with other kids. A lack of a TV makes dad’s go out and kick a can around with their children. Although things just look to terrible to imagine, that is only from our point of view. Obviously I am not referring to the details of the above movies, just in general. I appreciate your thoughts and for sharing them. Another irony. Happiness comes to those without stuff. The conditions for children in the three films above–forced to be a soldier, gender inequalities, exploitation–that’s different than living without “stuff”. I understand what you are saying. Western expectations of a good life and seeing those that don’t have it creates sympathy. Ignorance is bliss. If all you know is garbage heap to play on and slums to run through and your friends live exactly the same way, it would feel quite normal and why feel sad? Looking to the U.S., as a kid, I came from a poor family and I wasn’t aware I was poor until I played at a rich kid’s house one day. As an adult, I’ve seen wealthy parents spoil their kids with every conceivable toy/electronic device and they learned to hold their hand out instead of earning it themselves. It was a blessing to tell my kids there was simply no money to buy what they wanted. And they got used to that. Did they play outside? Yes. I was fortunate I lived in a rural town and it was pretty safe. All that said, I hated the worrying poverty brings and wouldn’t wish it on anyone. Ironies! Ah, you bring up a lot of issues, and for that, I thank you. Excellently written article, I remember watching Innocent Voices years ago. I missed this as I was in Chicago. Well I’ve only seen Slumdog Millionaire and I agree it’s a beautifully-made film though I didn’t think the romance aspect was all that convincing to me. The other two seem like a heart-wrenching films, naturally given the subject matter of children in poverty-stricken society. I like what you said how ‘the human capacity for love trumps blind destruction’ I think in harrowing films like this, it can still bearable to watch when there’s an underlying theme of hope and redemption to still hold on to. That’s exactly it Cindy, I look for the silver lining too. Even the most atrocious films about an evil person can still be bearable if there’s a redemptive quality about it. I agree that seeing children suffer is a lot tougher to stomach though. Another great post, Cindy. I’ve only seen Osama, but I agree with all of your thoughts. It’s a heart wrenching and powerful experience.